The much anticipated Eachine EV100 headset has finally arrived! Opinions have been quite polarized and unless you've never flown FPV before you're likely to find fault in the field of view (FOV). 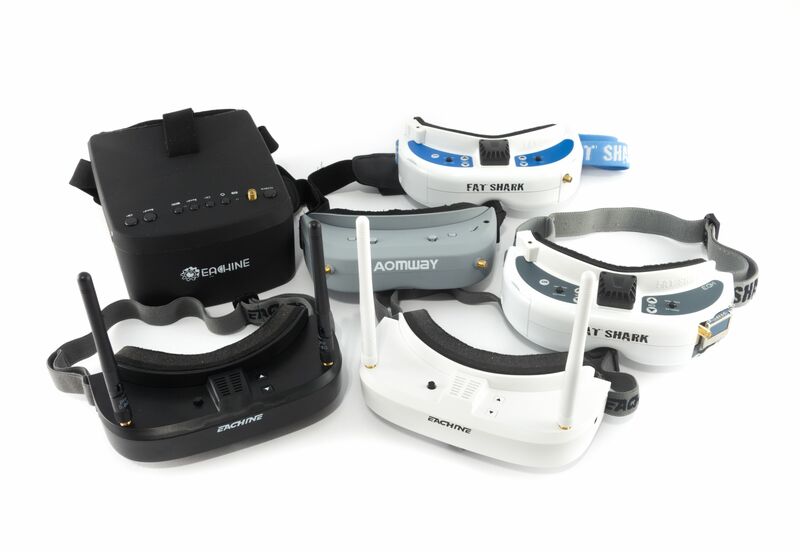 I've tried a number of headsets and have to admit that I've been spoiled by the FatShark HD2 and HD3 goggles. That being said these are nowhere near those prices, so I'd like to compare the EV100 to a few cheaper headsets. I've been a long supporter of the Eachine EV800. It's a great headset for the price (~$55). Feature for feature it's the most comparable headset to the EV100. Both include a single receiver, a battery and exclude a DVR. If you're on a budget then choose the EV800. It won't disappoint you. It's a box headset but cheaper and offers a much wider FOV. Plus the headset itself is relatively small for a box set. The Quanum V2 Pro is nearly double the size of the EV800 which in turn is only slightly larger than a FatShark case. So why choose the EV100? Because it's the first budget goggle-style headset. Until now the cheapest goggle was the FatShark Teleporter V5 which currently retails for around $185. The main problem is the field of view. 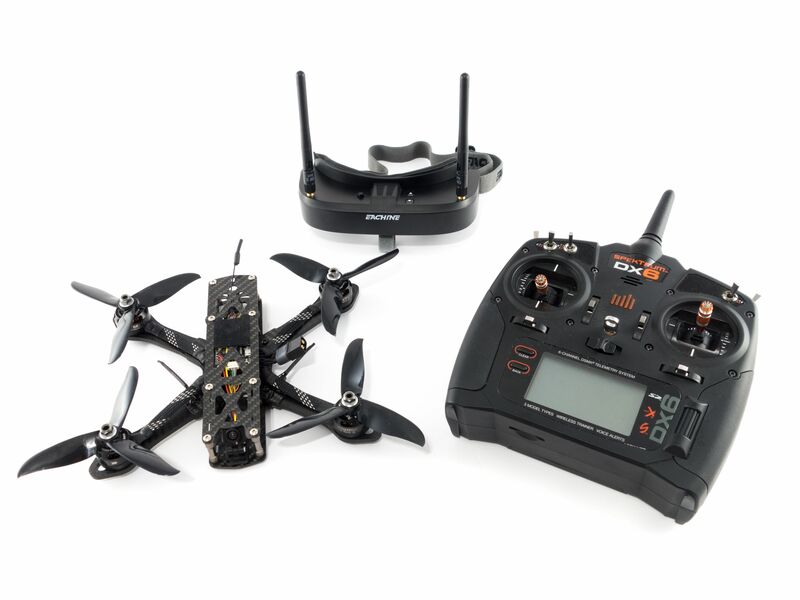 Eachine advertises 28 degrees, but it feels much smaller. 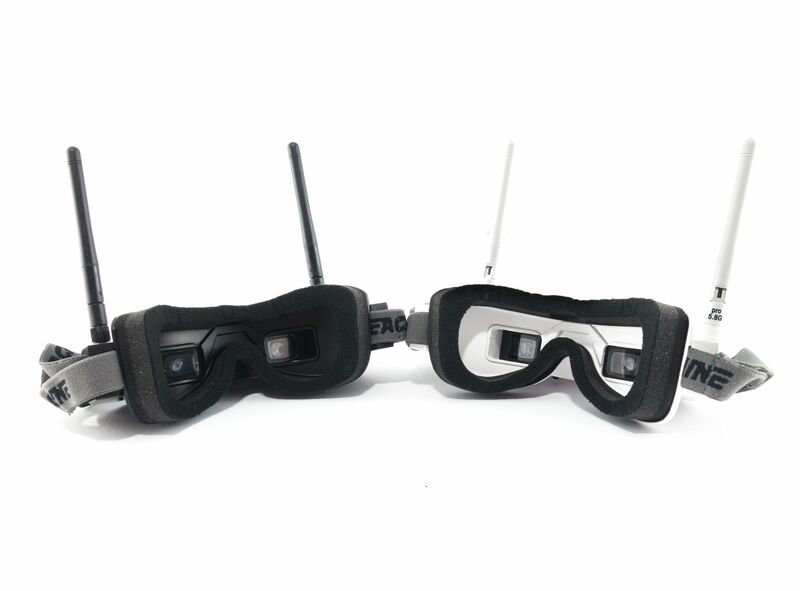 I compared these to FatShark Predator V2 goggles which offer a 25 degree FOV and the EV100 is distinctly smaller. Even though the Predator has a slightly lower resolution (640x480 vs 720x540) it offers a better flying experience. Unfortunately the Predator V2 can be difficult to find and only includes a 7 channel receiver (vs the 40 channels of the EV100). I know at least one local pilot who races with the Predator V2, so the channel limitation is not debilitating. That leaves the FatShark Teleporter. Unfortunately I was unable to track one down, but it also offers a 25 degree FOV at a much lower resolution of 320x240. My guess is that the FOV may still be larger than the EV100. FatShark rated both the Predator and the Teleporter at 25 degrees, so they're likely comparable. Otherwise that leaves us with the VR D2 Pro and the EV800D. Both are box headsets, but both offer true diversity and both include a DVR. These are nearer in price to the EV100, but offer more features. 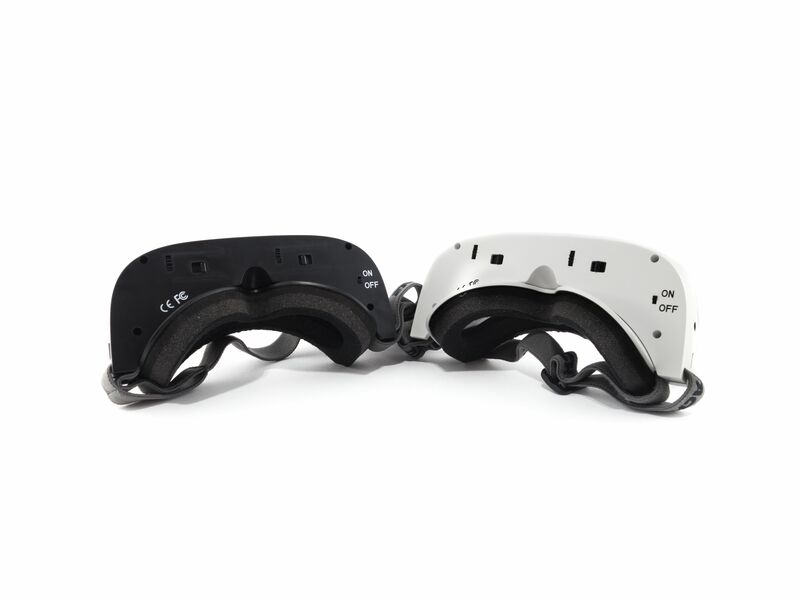 The diversity offered by these headsets is acceptable and the DVR is useful, but the EV100 has an external DVR that can be purchased separately. 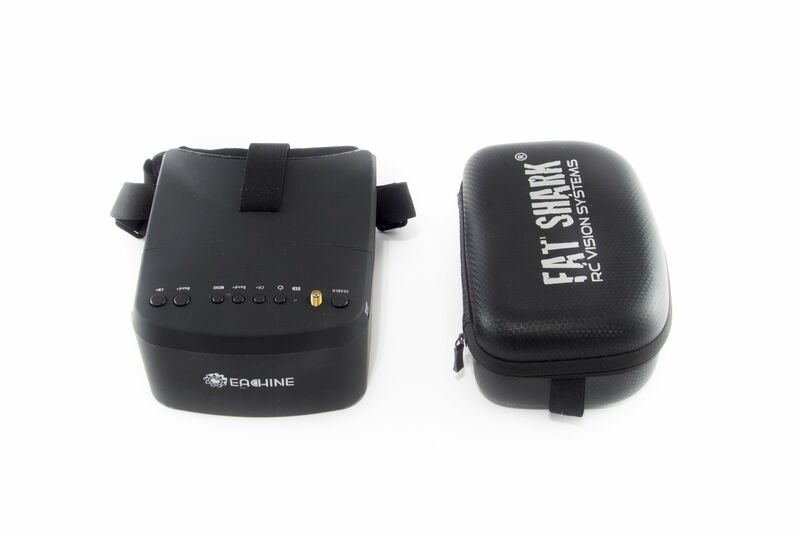 For more details on that read my Eachine EV100 DVR review. So what do I think? I spent a few days flying my Tiny Whoop around the house, and under these circumstances it's a very flyable goggle. I even enjoyed the experience. The pixel density is great and the image looks quite nice. FatSharks are somewhat pixelated, but not so much here. The colors are rich but a little over-saturated. If this is your first headset you may not even notice, but the brightness is limited. Even at maximum brightness the screens feel a little dark. As far as the fit and finish, these are just fine. They seem well made, look nice and feel light-weight. With the FatShark foam they're comfortable on the face and the headstrap is on par with the FatShark straps. I'm glad they didn't use velcro to attach the strap like the Aomway Commanders, but unfortunately you cannot use straps made for FatSharks because the slot is too small. When I took these outside to fly my 5" rig it was a different story. I flew a very familiar, very comfortable course and struggled to see where I was going. I hesitated to take a few gaps, and the flight was so nerve-racking that I couldn't fly a second pack. Now take into account that I normally fly FatShark HD3 goggles and enjoy a much wider FOV. I've heard accounts of pilots swapping up to the EV100 from the EV800 who loved the upgrade, so it really comes down to your FOV tolerance and possibly your eye-sight. Should you buy these goggles? I can't say. I've read a number of positive reviews on the RCGroups thread, so some people like them. If this was my first headset and I paid $90 during the promotion I'd be happy with them, but I wouldn't pay $159. Hopefully the price will stabilize closer to $120. 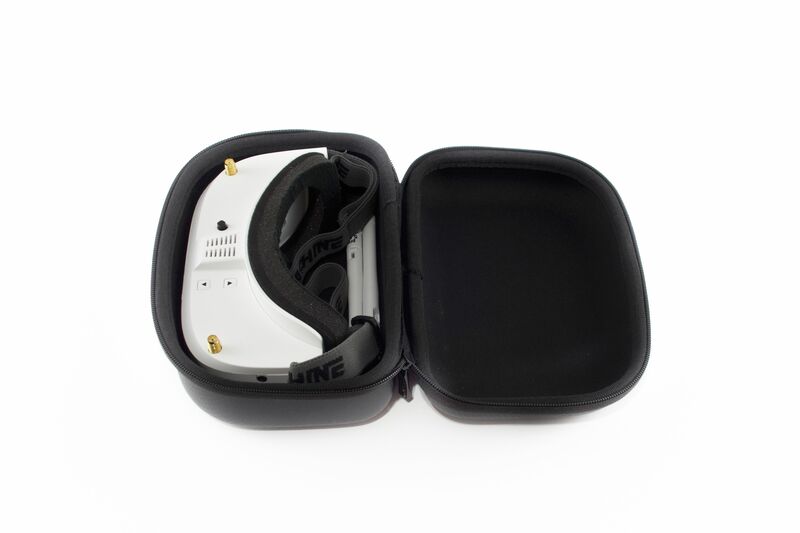 While the EV100 includes two antennas, it does not have two receivers found in a typical diversity headset. A typical diversity system uses two receivers with two received signal strength indicator (RSSI) signals. These signals are constantly compared, and the better of the two gets relayed to your headset. You'll always see the video with the higher RSSI value. The EV100 uses antenna diversity which is slightly different. Instead of two receivers, only a single receiver is employed, so only one RSSI signal is available. What happens here is when the RSSI signal is acceptable it'll continue using the current antenna. When the RSSI signal falls below a certain threshold the receiver switches to the other antenna, not knowing whether or not the signal is better. So basically it uses an arbitrary antenna, and if the RSSI is below a certain threshold it switches to the other antenna. For a more in-depth analysis of the EV100 receiver please visit fishpepper.de. That being said, the EV100 signal quality is on par with most single antenna receivers. It's really hard to say that the antenna diversity improves the signal by any substantial degree, so they're on par with the EV800. There is an internal blue LED that bleeds into the right display. The only solution is to disassemble the goggles to cover it up. There have been reports that some units do not exhibit this problem, so they may have corrected this. The "face sponge" is too thick. It pushes your face so far back that the displays become cropped by the circular holes. Some people have trimmed the foam down, but I found that using FatShark foam works fairly well. Every so often the screen will flicker as if you blinked your eye. It's very quick so it may not necessarily interfere with your flying, but it is an annoyance. Eachine is apparently working on a firmware update that may fix this. Some users have reported black bars showing up on the displays. Neither of my units exhibit this issue, but we are waiting to hear from Eachine concerning a solution. Hopefully this can be solved through a firmware update as well. The video signal gets cropped, so some OSD elements may not be on screen as you'd expect. This is also supposed to be fixed with the firmware update. There's no denying that this is a cool, modern piece of technology. There are some limitations, but if that works for you then fantastic! I'll probably keep one around as a passenger set, but I doubt I'll use them from day to day. It is possible to increase the range by replacing the antenna's? If so, which antenna's should I buy then? These aren't "terrible". The picture quality is not bad at all but DAMN it's a small screen and narrow FOV. I've not used a small set of goggles before aside from a buddy of mines older fatsharks (these are better than those but still). I'll use them for a little while to feel like I got my money's worth and then let my oldest daughter have them and just bite the bullet and drop the coin on a set of HD3's. I'd hold out for the next wave of headsets. There's a good number of HD3 "killers" coming out that just may take the crown. Great review. Really appreciate that Whiffles. Sure thing! I plan to keep them coming. Hey got mine too on the 1st batch, also have the ev800 as my first googles. Does your audio jack work? Also AVin work? I haven't tested that. In fact, I don't think any of my quads have a mic. ahhh gotcha, hmmm, how about the AV in? I'll have to test that. I do have an old Boscam receiver I can try. I'll get back to you. I just gave this a test and AV in does work. What cable are you using? I have an old RCA to 3.5mm that doesn't work. The cable that comes with my FatSharks works though.